The G.W. 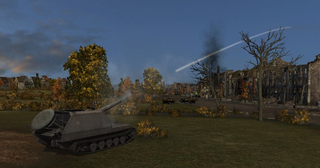 Tiger is a German tier 9 self-propelled gun. El desarrollo de una AAP sobre el chasis del Pz.Kpfw. VIB Tiger II comenzó en 1942. 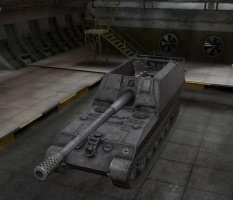 El proyecto solicitaba el diseño de un transporte de cañón autopropulsado común para el cañón 17 cm Kanone 72 y el howitzer 21 cm Mörser 18/1. El concepto de la AAP permitía el uso de sistemas de artillería tanto desde el transporte como desde el suelo. Los trabajos para fabricar un prototipo experimental comenzaron en 1945. 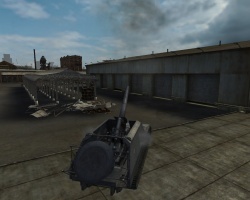 With its largest gun, this massive artillery hits for roughly 2,000 damage, but fires at only 1.25 rounds/min. 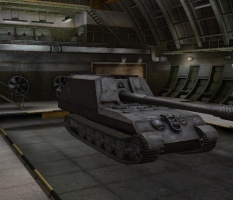 Due to its large damage output, the GW Tiger is one of the most feared artillery on the field. Following the tradition of the other German artillery, the GW Tiger is fairly mobile (although noticeably less so than the Hummel or G.W. Panther) for its size and is capable of speeds of up to 35 km/h. The G.W. Tiger leads to the G.W. E 100. 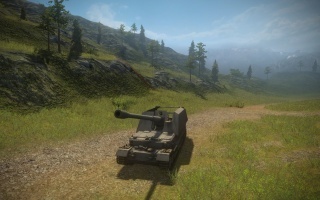 The GW Tiger has the most powerful gun of any tier 9 artillery, but also the worst mobility of them. 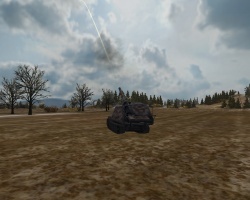 It can hit anything hard, but has difficulty relocating around the map to get different angles. It has a decent vertical shell arc, but its narrow horizontal gun traverse forces you to traverse the chassis to switch targets often, resetting your aim. 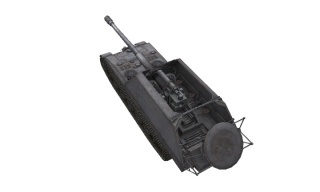 It's lack of gun depression along with its low mobility and narrow gun arc hinders its ability in TD mode, limiting it to ambush situations. It is generally considered inferior to the M53/55, which has higher mobility and better horizontal gun arc for only slightly less splash and alpha. You should immediately mount the top gun, which is lighter than the stock gun and should be researched from the G.W. Tiger P.
Research the suspension next, then get the upgraded engine. On the 6th of May 1942, Krupp presented the first proposals for an armored self-propelled carriage (gepanzerte Selbstfahrlafette) using the Tiger I’s components for mounting either a 17cm Kannone K72 (Sf) L/50 or a 21cm Mörser 18/1 L/31. The program was later amended in November 1942 to use Tiger II components because by that time the Tiger II was rapidly being designed and finalized and in the planning stages for serial production in 1943. 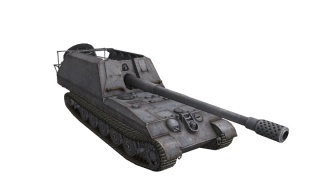 It was to be able to mount the 17cm K72(Sf) L/50 gun and designated Grille 17. 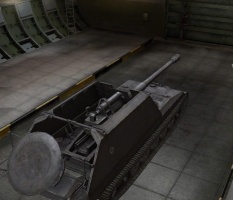 The 17cm K72(Sf) L/50 gun had a range of 28 to 29.6km. 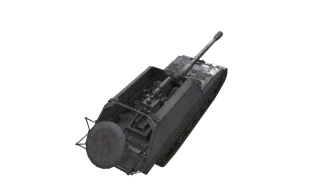 The Grille 21, armed with 21cm Mortar 18/1 L/31 was to be produced alongside the Grille 17 and it had a range of 16.7km. As an further alternative, the Grille 30 proposed in January 1945, would have been armed with the Skoda 30.5cm GrW L/16 mortar firing fin-stabilized HE shells out to a maximum distance of 10km. Additionally, there was the project Grille 42, also proposed in January 1945, which was also under development and was to be armed with the 42cm GrW mortar, also designed by Skoda, firing fin-stabilized HE shells out to a maximum distance of 10km. Both the 30.5cm and 42cm guns were test fired after the war by the Soviets. In 1943/44, Krupp started production of the prototype, while full-scale production was to start in mid-1945 at a rate of 2 per month. The prototype was still incomplete at the end of the war. Grille 17/21/30/42 had its armament mounted on the rail platform inside the hull. There were originally plans to have the guns dis-mountable but these plans were dropped in 1944 due to their complex nature and all of the GW Tigers were to be completed as normal SPGs. 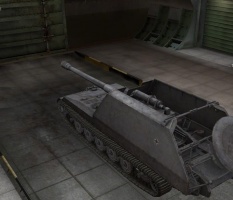 Each variant was also armed with two 7.92mm machine guns(source?). 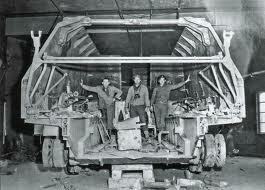 It would be operated by the crew of eight (Driver, Commander, Gunner, Radio Operator, and four Loaders). Powered by the Maybach HL230P30, the Grille would be able to travel at a maximum speed of 45 km/h with a range of 250km on the road and 150km cross country. Fuel capacity was to be 1000 liters. The Grille was 13 meters long (with gun), 3.27 meters wide, and 3.15 meters high. Its armor protection ranged from 16mm Armor Plate(side) to 30mm Carbon Steel(front). 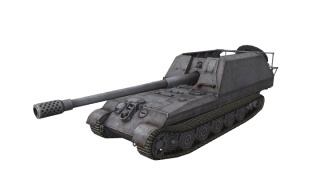 The Grille 17 weighed 58,000 kg, but only carried 5 rounds of ammunition. The Grille 21 weighed 52,700 kg and carried only 3 rounds of ammunition. One prototype with a 17cm gun dismounted and resting nearby was almost completed in May of 1945, and was captured by British troops at Haustenbeck near Paderborn.